The mission runs of August 6 and 9, with Hiroshima, Nagasaki, and Kokura (the original target for August 9) displayed. 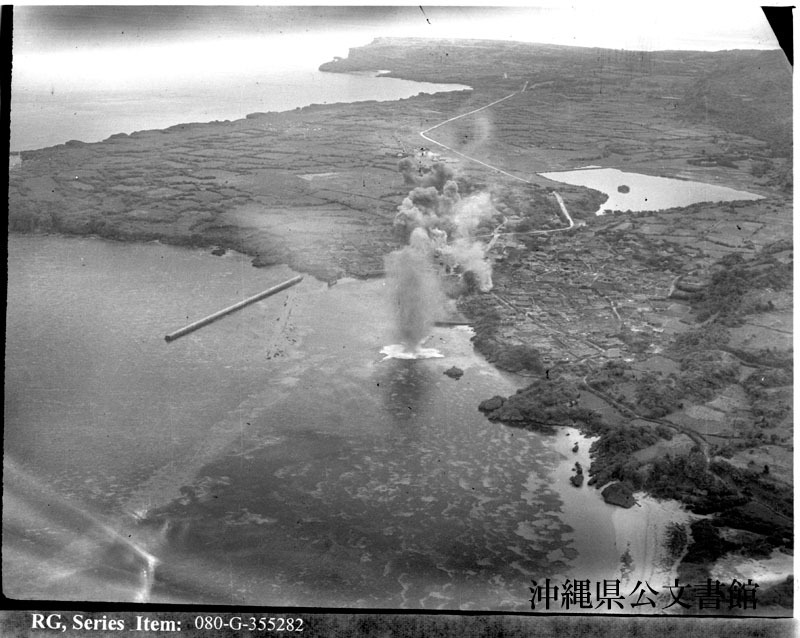 Lt. (jg) Howe, bombing Yonakuni Island off Formosa. Boeing B-29 ”Superfortress” taking off from Yontan Airstrip, Okinawa, Ryukyu Retto, on return trip to its base in the Marianas. This plane landed at Yontan after being forced down by damage in a raid somewhere over Japan. 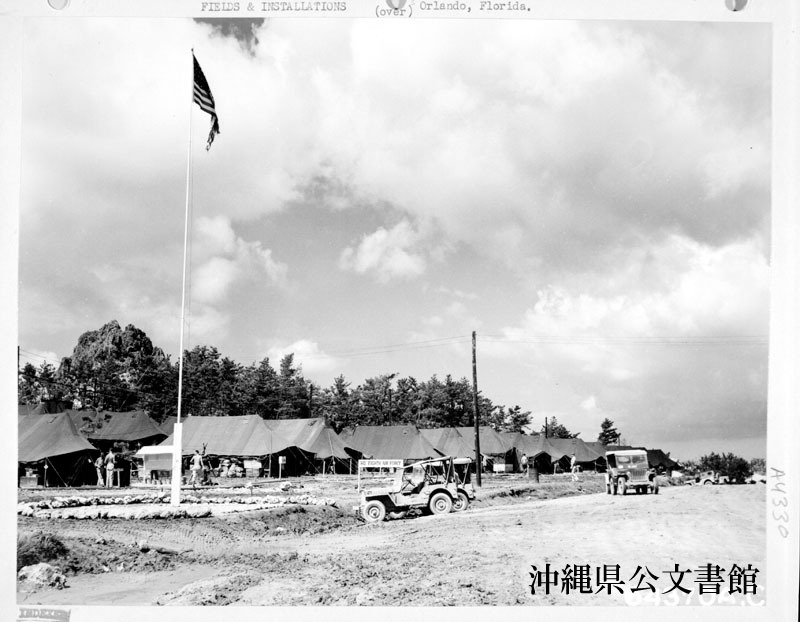 8th Air Force Headquarters Area located near Kadena Strip #1, and site of Lt. General Doolittle's Office. 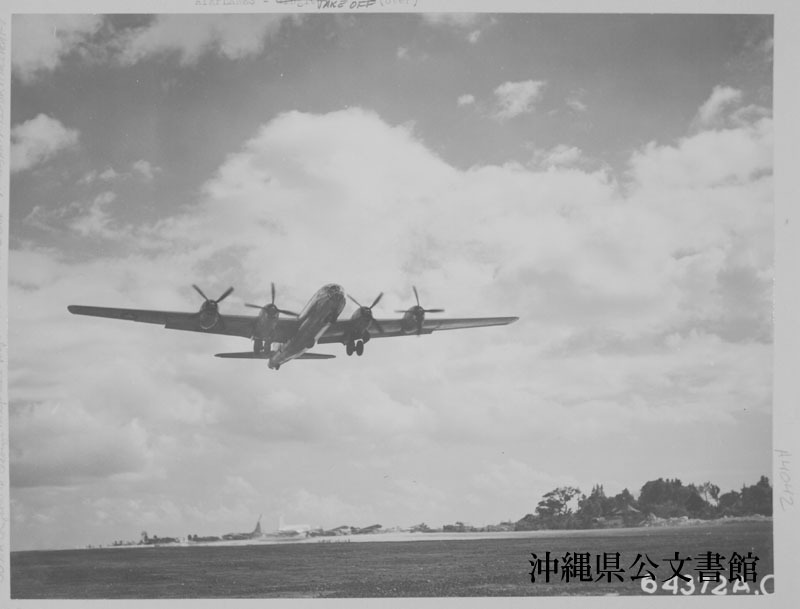 It was from here that Boeing B-29 ”Superfortresses” operated in the bombing of Japan. 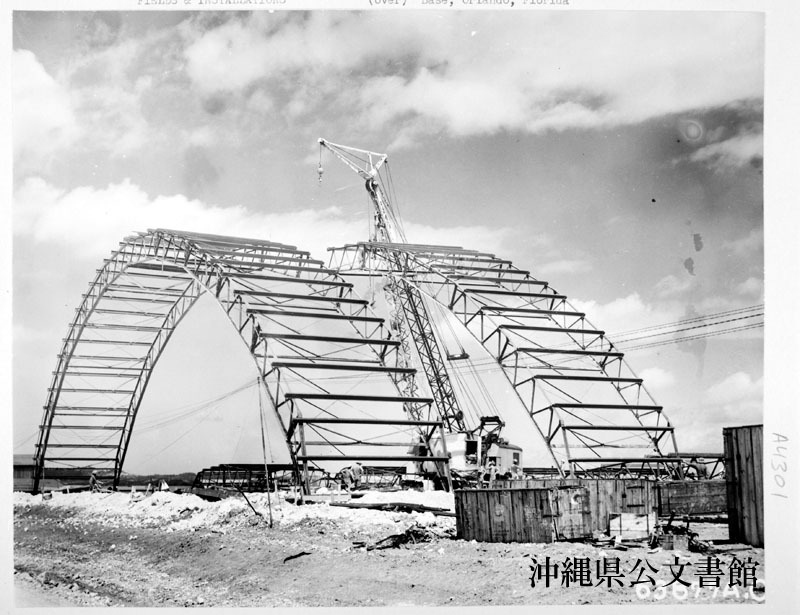 Butler hangar being constructed by the 130th NCBS. A northwest crane carrying a quarter section truss to assemble to truss already in place which is known as “steel meets steel“. 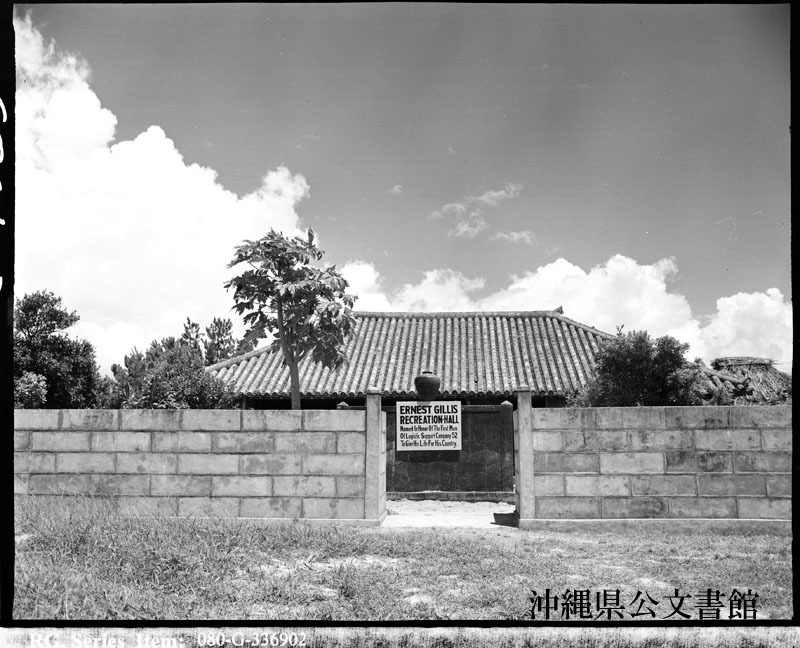 This hangar was completed for use by the 7th Air Force on Yontan Strip. Okinawa, Ryukyu Retto. 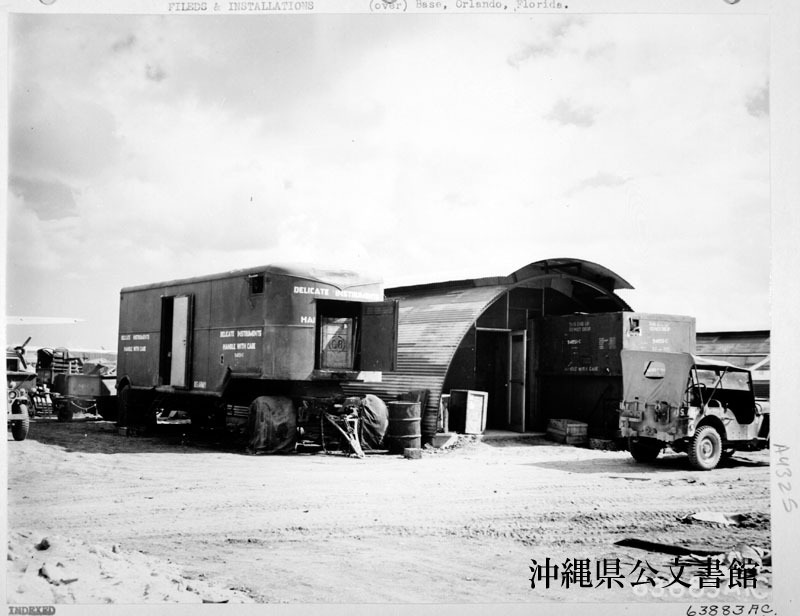 Instrument shop trailer and quonset hut of the 13th Air Service Group on Yontan Strip. This outfit serviced planes for the 7th Air Force, Okinawa, Ryukyu Retto. 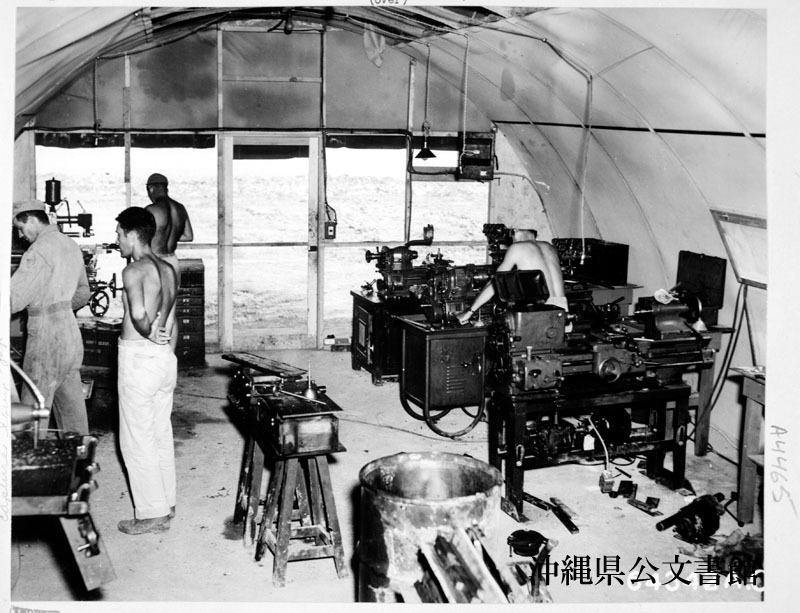 The machine shop of the 613th Air Engineer Squadron was set up in “quonset huts“ on Yontan Airstrip to do work for the 7th Air Force. At the right (foreground) is a lathe of Japanese make; the other two in background are of American manufacture. Okinawa, Ryukyu Retto. 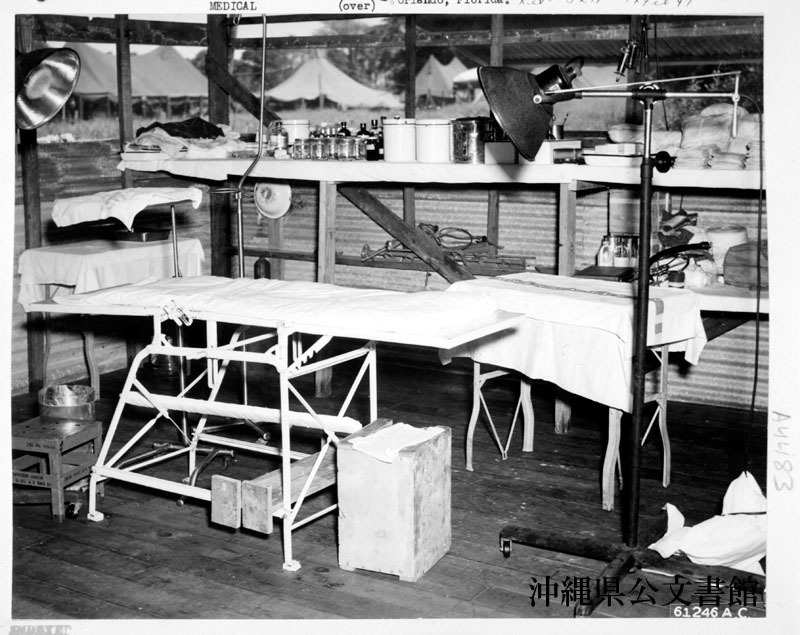 Interior view of main surgery in the 29th Portable Surgical Hospital， located near Yontan Airstrip, which is under operational control of the 5th Air Force. This unit can transport enough equipment to operate for 30 days in 11 Douglas C-47 ”Skytrains”, leaving a rear echelon to be brought up later. These hospitals are usually set up within a short distance of airtrips to handle emergency cases such as injured crewmen. The 29th Portable Surgical Hospital gave outstanding performances at Wadke, Biak, Tacloban. Patients are held here until recovered enough to be transported back to a station or general hospital. Okinawa, Ryukyu Retto. 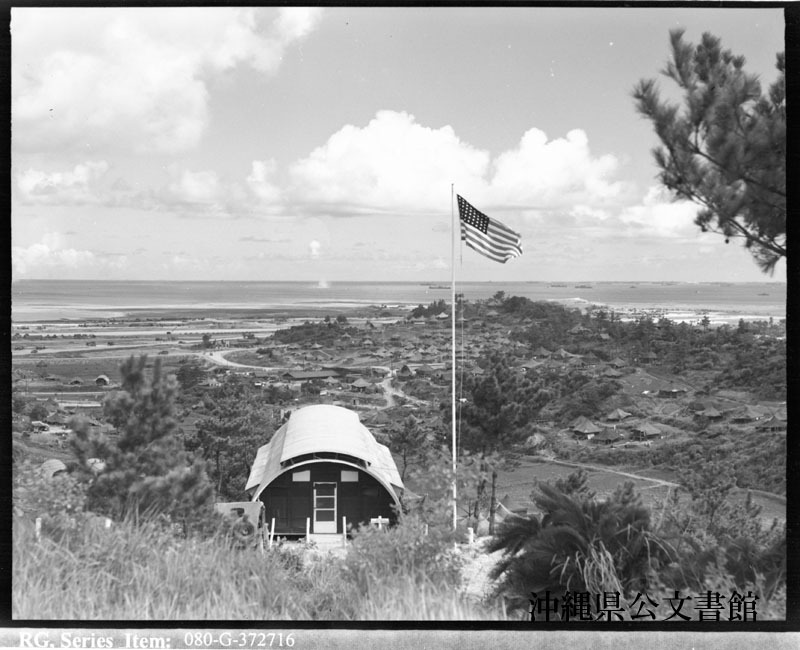 Logistics support company on Okinawa. Recreation hall named after first man to die in line of duty. 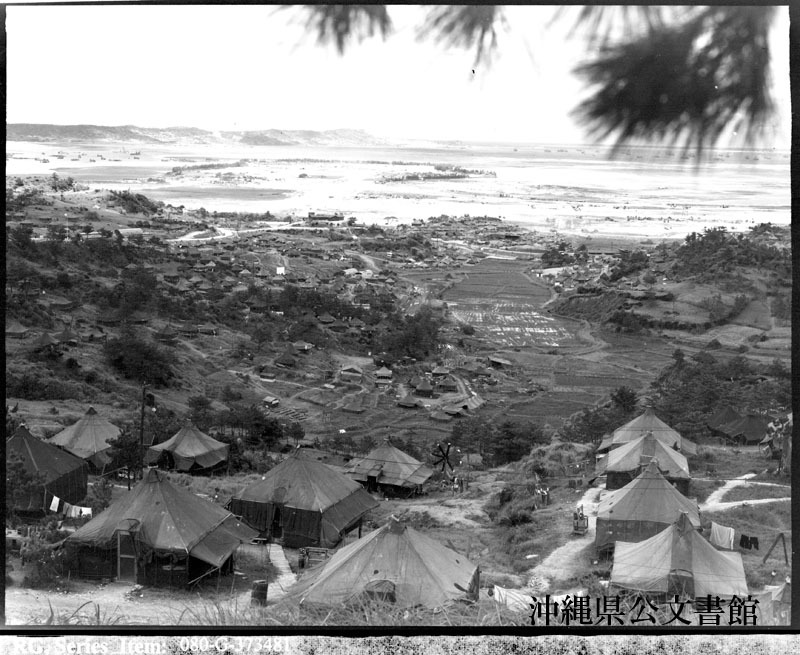 Bivouac area adjacent to Awase Airfield, Okinawa. 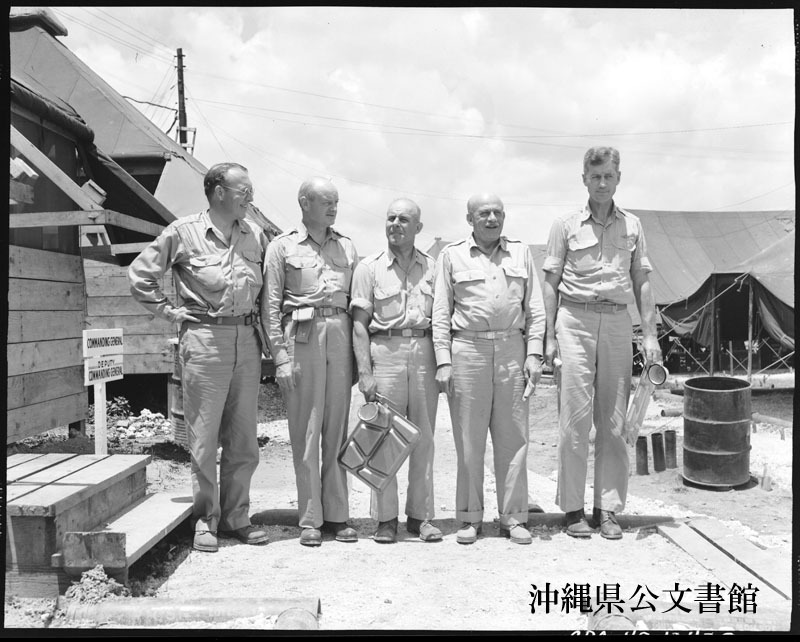 Confering on Okinawa are a group of newspaper publishers and military officials. They are l. to r., Mr. John Cowles, Minneapolis Star; Mr. J. O. Adler, New York Times; Lt. Gen. J. Doolittle; Mr. John Knight, Chicago Daily News; and General Early Partridge, Deputy Command General. 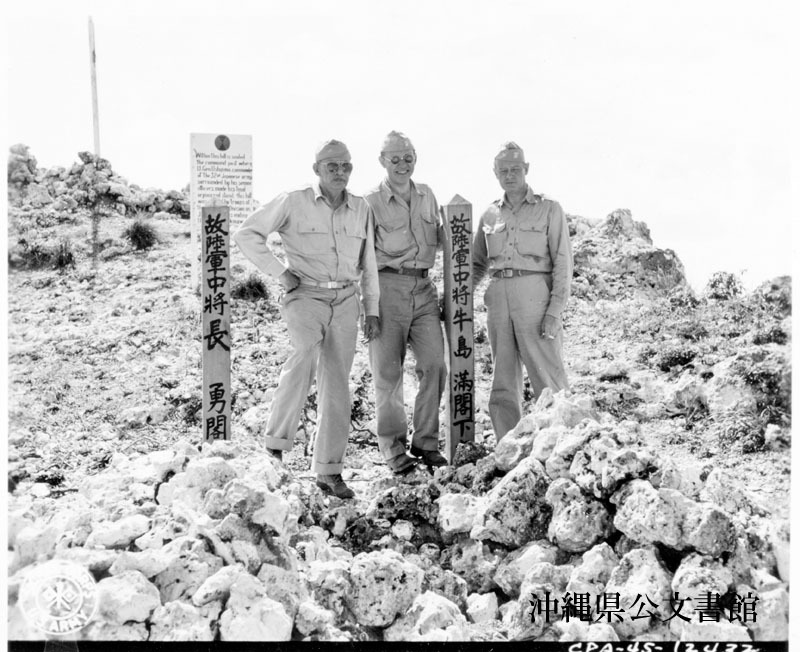 Three newspaper publishers, visiting Okinawa, stand beside the graves of two Japanese Generals who committed Hara Kiri. They are Mr. John Knight, Chidago Dairy News; Mr. John Cowles, Minneapolis Star; and Mr. J. O. Adler, New York Times.